First flight today in 20 years! Yesterday, I bought a HZ Super Cub and took it for my first flight today. It's been 20 years since I last flew a RC plane and I had a successful day, went through 2 batteries, and no crashes! After reading the forums, I learned about Absolute RC Simulator for my iPad, which prepared me well. Also, reading this forum gave me some great tips for my first flight. I wanted to say thanks to those in the forum and especially thanks to the Flite Test team for getting be psyched about getting back out there and having fun with it. Here's pic of my plane after a successful landing. What a great day! Good Job! we always like beginner stories of success! The super cub looks like its a great plane. I've never flown one though. Again, great job, and I hope you stick around. The SC is a great little plane! As you gain experience, you'll want to do bomb dropping, add lights for night flight, add ailerons and/or flaps, upgrade the motor, add floats, etc. In short, it's a hard plane to outgrow, because of its versatility. Where in San Fran do you fly? My brother is in Berkeley and is considering a Super Cub. The place he wants to fly looks a bit crowded in my opinion, although he's got a co-worker that can buddy-box with him until he's less likely to crash. Did you do any of the "critical" mods to your SC yet? There are a few things which every SC needs to help it have a long and productive life. Reinforcing the battery box, reinforcing the back edge of the wing saddle, packing tape on the wing (or in my case also the fuselage), etc. I also used packing tape on the inside of the cowl to strengthen it as it's made from the thinnest plastic known to mankind. I taped my first on on the outside, but that just looked bad. Good luck with the futue flights! You don't need to be in a hurry, but I'd do things like reinforcing the cowling and running a strip of packing tape along the wings leading edge. 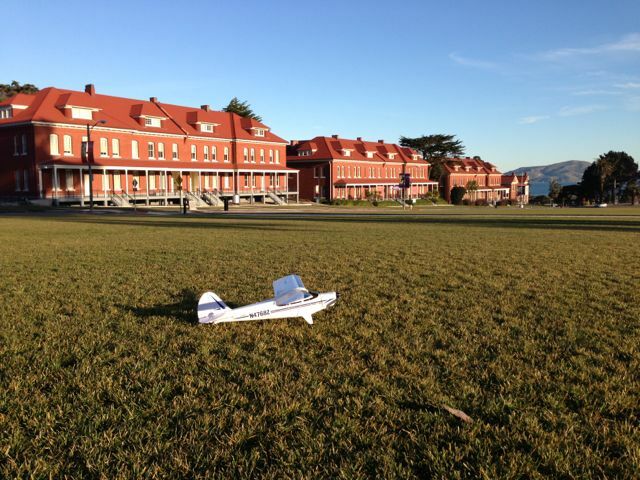 Joker53150, today I flew the SC in Golden Gate Park and the Presidio. There seems to be a few good places in SF, thanks to all the parks. Most have ample room for the SC, at least a few hundred feet. Robschonk, I appreciate the list of mods, those posts are really helpful. I'd love to put some ailerons on the SC when I get better. Quick question: My transmitter has dual rates ( low = 70% ). Do you think I should keep flying on low rates for a while? That's a great looking flying site!!!! I'll pass that on to my brother if he actually gets the plane. I'd go with low-rates most of the time, but if you've got some altitude and want to see what it does switch it over to high. Also, are you using the "Anti-Crash Technology"? AKA "Always Crash Technology". I used it once and then unplugged the sensors and cut the wires - no way I was ever using it again. The plane kept trying to correct my flight when I wasn't in any danger. As a new pilot I thought I was making the changes, and then tried to correct what I thought I was doing. It seems that many (most?) SC owners dislike the ACT. The ACT is really bad! It orients the plane by sensing light and dark - the sky is light and the ground is dark. It gets freaked out when you fly the plane over a light colored surfaced and when you pull a tight turn or loop. Blech!